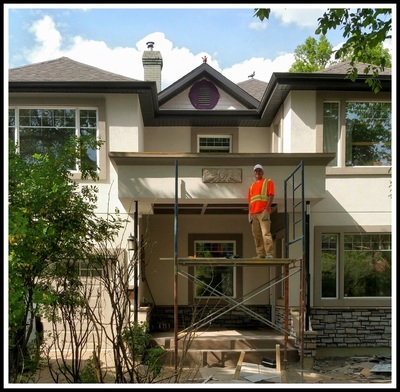 Rocco Masons Blog - A blog from Saskatoon about Stone Masonry, Stone Carving, Masonry Designing, Stone Work and Bricklaying. - Rocco Masons - Commercial & Residential Masonry specializing in Architectural Stone Carving and Design in Saskatoon, SK. Rocco Masons has been rockin' and rollin' on Broadway Avenue at the Smith Block Building for one of Saskatoon's most excellent restaurants, CALORIES! We're right in our element since restorations happen to be our specialty, so Owners Ryan and Nicolene Watson felt privileged and honored when asked to be a part of another historical project early last year. Our scope of work involves a total brick and Indiana limestone facade, a three piece hand carved Indiana limestone "Smith Block" and date sign that weighs in around 400 pounds, along with a colossal hand carved limestone pediment for the buildings entryway. Now that the Smith Block sign is complete, our Stone Carver and Masonry Designer, Ryan Watson is hard at work carving the massive 800 pound pediment. Watson continues to use traditional stone carving methods and tools that date back to the early 1800's. Once complete, the facade will greatly mimic the facade from 1912 as shown below, along with some added details throughout. ​Smith Block was built in 1912 by the Bugenhagen and Turnbullof, who were also the architects of the Farnam Block. Previous tenants of this building include, Early’s Seed and Feed Company (which is now located on Lorne Avenue), the Free Methodist Mission and a branch of the Public Library. The chief librarian at the time, James Stewart Wood, lived in the upstairs suite until his death in 1961. WILL WATSON'S MASONRY WORK BE AWARDED ONCE AGAIN? Part of my role within our company is to apply for Heritage Awards for projects we've completed that we feel meet the criteria of Saskatoon's Heritage Society. The last award Ryan Watson received was for his Design work and Masonry installation on the King George Hotel that includes two hand carved Indiana limestone door surrounds. Next time your at Swank Shoe Lounge or Cupcake Conspiracy, be sure to take a closer look! This year I had the pleasure of submitting three applications. The first for our work on the historical Hopkins House on Saskatchewan Crescent, our Masonry Design and installation at Broadway Avenue and 11th that now houses freshii, Una Pizza, and Ryde yxe, and a total restoration to Taverna Italian Kitchen & Bar downtown on 21st. Ryan and I hit the streets last week with the board members and were proud and honored to show off our work at these three locations. Above is the historical Hopkins House that we were asked to be a part of with Strata Developments. Our scope of work included replacing the homes disintegrating concrete stair treads, with Indiana limestone, each tread weighing in at 650 pounds. Indiana limestone was used on the original structure in 1910 for all of the window sills, lintels, and plinth details. We replaced all cement details including the homes sills, stair treads and capstones with Indiana limestone. We tore down the two brick posts at either side of the staircase, cleaned each brick piece by piece before re-using them to return the posts to their original state. Once the posts were rebuilt, we capped off each post with 1900 pound limestone caps. We were very pleased when the home owner decided to use our recommendation of limestone for the bases of the homes ionic columns to replace the homes original rotten wooden columns. Next, we laid limestone flooring throughout the patio which starts at the front entrance and wraps around to the back of the home. Above is our project at Broadway Avenue and 11th which was the old McDougall Gauley building. Our scope of work here included designing, supplying, fabricating and installing eight Indiana limestone pilasters around the buildings facade at street level, with brick above each. The pilaster detail includes a combination of smooth and rock faced textures similar to centuries old masonry architecture style. Each pilaster is capped off with hand fabricated limestone mouldings. We have designed and hand carved two street signs to be installed in the spring of 2018. One sign will be installed on the pilaster facing 11th street east and the other facing Broadway Avenue. These carvings will accompany two additional hand carved architectural details also installed this spring. All stone fabrication was traditionally done on site by hand before being installed. Many of these Indiana limestone pieces used to build the pilasters weigh in at 280 pounds each. We also fabricated the moulding returns by hand on site prior to installation. And last but certainly not least, our restoration to Saskatoon's oldest Italian eatery, Taverna Italian Kitchen & Bar located in the heart of Saskatoon on 21st Street. Our scope of work included; a brick and limestone combination on the exterior including the following limestone detail; dentils, a greek key motif, rock faced pilaster bases, numerous stone moldings, two hand carved Indiana limestone signs using the traditional tools of the Stone Carving trade. The first hand carved sign is of the name of the building; AGORA with THYRSUS detail below. The second hand carved sign is a date stone; 1907 EST. to pay homage to the year the building was originally built. We also restored the lounge's fireplace to match the exterior as shown below. Our Stone Carver and Masonry Designer, Ryan Watson had the pleasure of designing Taverna Italian Kitchen's fireplace. This Summer we installed the limestone and brick facade on the building's exterior (as shown below and throughout our website), so Watson chose to carry on the same vibe inside. "No job is too big or too small for these hard working boys! Thank you Rocco Masons for installing the 800 lb Italian fountain in our backyard. Job well done!! We also were honored when The Schwandt's asked our Stone Carver & Masonry Designer, Ryan Watson to design and carve them an angel for their entryway, along with the homes exterior Masonry! 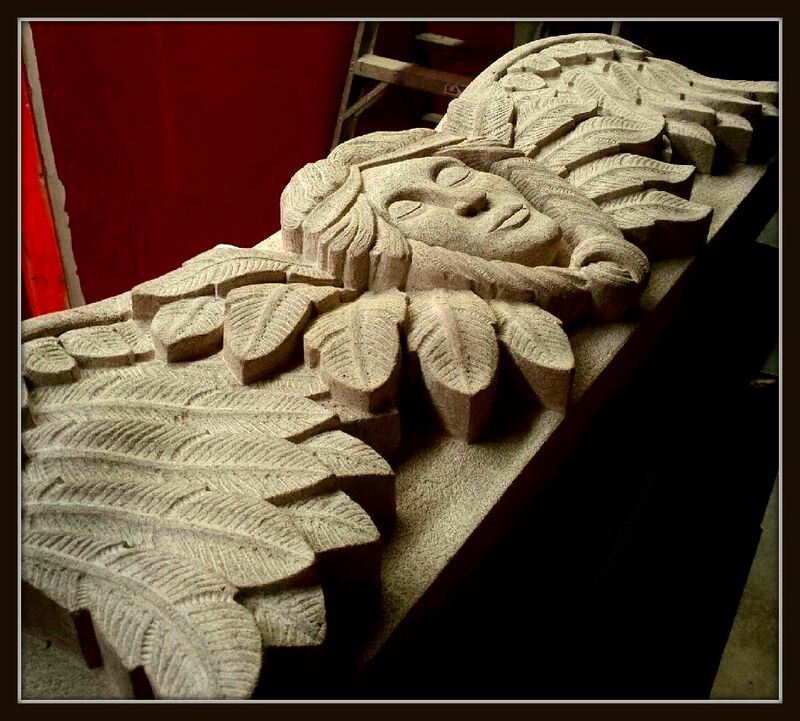 For a time lapse of this hand carved Indiana limestone guardian angel click on HERE! "We couldn't be happier with the results of the work done by Rocco Masons. With Ryan's help, we achieved the look we were hoping for. We are doing a renovation to our 100+ year old character home on Queen St. Our goal was to spruce it up while paying respect aesthetically to the traditional appearance of our home. I've always loved angels! After giving Ryan an idea of what I would like to have, he went to work to design and carve a beautiful piece that we are proud to embrac﻿e as part of our home. She is an amazing work of art - Ryan is a truly talented artist. Ryan and the boys also installed the beautiful stonework on the front entrance stairway and to the front exterior of the house. The job was ﻿done professionally and in a timely manner. They gave us a date for completion and it was done on time! Thanks to Ryan, Nicolene and the boys for their knowledge and exemplary customer service". Nicolene Watson, Co-Owner of Rocco Masons since 2013. "Nicolene is the brains behind the scenes at Rocco Masons. She naturally knows how to run a business. When she wants something there's no stopping her", says Ryan Watson, Nicolene's husband and the companies Founder & President. Since 2013 Nicolene manages the office and directs all aspects of the business including Accounts Payable/Receivable, Human Resources, Web Design, Marketing, Advertising and Social Media. "I finally found my dream career at fourty that fits me like a glove"! Copyright © 2017 - ROCCO MASONS CORP - All Rights Reserved.